The annual election will be held with the July mailing. Candidates for office should file with Secretary-Treasurer Schwart as soon as possible. Al Ashley, President * * * * * * * * * * * * * * * * vice president's message The continued derelection of one third of the Laureate Committee makes it still impossible to carry out the planned quarterly laureate reports. I am sorry about this, but hope to have it straightened out by the next mailing. There are 26 signed petitions on hand to set aside the Voting and the Mailing Date amendments--not quite enough to equal one half of the active membership. If there are still any members who favor this petition who haven't signed, please do so right away. As there seem to be no requests for Vice-President interpretations on hand at the moment, the membership herewith is granted a (doubtless welcome) rest from my "pompous" rulings, and legal "quibblings". Al Ashley, Vice-President * * * * * * * * * * * * * * * * larry shaw's message At the time of the last fapa mailing, Doc and I planned a sheet explaining the lateness of same, setting down our resignation, and carrying a few explanations as well. Ashley has made it unnecessary for us to print our resignations; everybody knows the mailing was late, but the explanations are probably more necessary than ever. It is all my fault that the proposed sheet didn't appear, and I apologize to the other Futurians concerned as well as the rest of you for the omission. Following is a section of that sheet (which when we told Al about it was going to be The FA, section C, but which we later thought of as the second "fapa bulleting"): The 30th mailing As no one needs to be told, section B of the 30th fapa mailing was more than slightly delayed. This is not a new situation in fapa; Larry Shaw is not the only official editor who started out with virtuous intents of punctuality, then was unable to fulfill them. However, since an issue seems to have been made about this particular (delayed) mailing, it seems wise to review the entire situation at this time (March 2nd). The mailing was held up, in the mail, three times. The lst two delays were relatively ordinary and minor ones; for these, ex-president Lowndes accepts full responsibility. At the 2nd Saturday in June, when the mailing was due to go out, certain reports [did?] not come in. 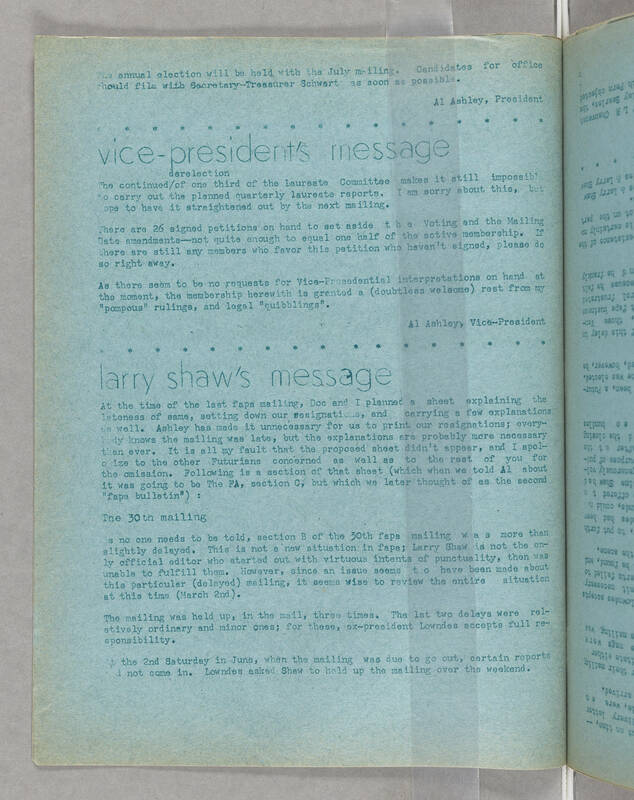 Lowndes asked Shaw to hold up the mailing over the weekend.